We flew home to close on our mountain cabin we’ve owned for the last 3 years. We’ve made a lot of great memories over the years but it’s just too much to worry about while we are on the road. We tried for a year and it’s just stressful. 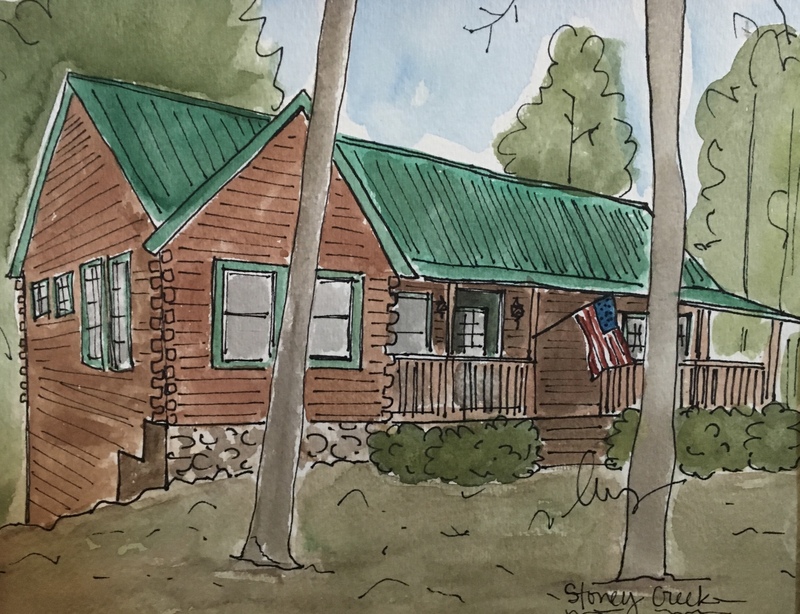 We sold our primary home before setting out on this adventure but thought we could keep the cabin and rent it out but the management company was a pain to work with and it just didn’t seem worth it. We put it on the market not expecting it to sell so quickly. That’s what happens when you have a fantastic Real Estate agent. Anya Dupree sold our our primary home in Cobb County in one day and the Ellijay cabin in a month. If you need an agent in that area, message me and I’ll get you her info! The Daniell’s had this made for us as a keepsake of our “Stoney Creek” cabin. It’s perfect!! I can’t wait to have a place to hang it! We sold the cabin furnished so we only had to drive up there to get some personal things out of the storage closet Chris had to fly to Boston for business so just the girls and I flew home and took care of all this. We rented a U-haul because we couldn’t remember what all was up there- the U-haul was way to big for what we needed but it made it easy for packing. It’s been 20 years since I’ve rented and driven a U-haul truck; they haven’t changed much. Abby loved the old school window crank handle. I will say that I was able to reserve and pick up the U-haul via my cell phone. I took pictures of any damage, uploaded the information and then just picked up keys from the man behind the counter at the gas station. My brother and family came to help me with this task and for one last hoorah. My sister stopped by on her way to Panama City to help family there with Hurricane Micheal cleanup. She and the girls made apple crisp to take there and for dinner with us. Thank you, we couldn’t have done it without you all! We took one last hike and walk to the lake. As it turns out, it may not be the last time because the folks that bought the cabin are going to rent it out so we can go back anytime we want to rent it! At closing they so graciously offered for us to rent it for just the cleaning fee- so sweet! After we moved out of cabin, unloaded our stuff at the Watkins and went to the closing we spent the rest of our vacation hanging with friends and family, at their houses of course, because we are officially homeless! Best friends are ones that you don’t see or talk to for months or even years (Kristy) and while you are chatting over ice cream or coffee you pick up right where you left off and it seems like you see each other every day. We planned a low key gathering at the old neighborhood playground so we could see as many friends as we could on our short stay. The kids played so organically with games of capture the flag and pick-up basketball. Mackenzie has been wanting to get her ears pierced since her 10th birthday (family rule) back in May but hasn’t felt up to it because she always dreamed of doing it with a friend. Well, her BFF waited until she came into town and they went together! Abby and her friends came along for support. We stopped by their Elementary school to have lunch with friends and visit teachers. On the flight home, our Delta pilot let the girls sit in the captain’s chair and pretend to fly. We will be back in January with the RV for a month! See you then!